Home › 5. 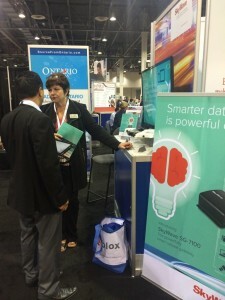 M2M/IoT Trends › CTIA 2014: That’s a Wrap! CTIA 2014: That’s a Wrap! M2M and connected devices are widely recognized as growth markets among mobile space industry leaders. So it is no surprise that this year’s Super Mobility Week Powered by CTIA proved out as a hot-bed for showcasing new M2M innovations and applications. The diversity and pace of change inherent within the M2M/IoT space presents numerous opportunities for companies currently operating in this market. One recurring theme we heard at the SkyWave booth was the market’s need for flexibility to integrate, connect and leverage smart device technologies. With the ultimate intent to better manage their equipment, costs and revenues, businesses are looking for ways to gain more visibility into their operations and connect their remote devices to applications. Applications that connect every remote, fixed or mobile asset back to the enterprise and deliver real-time information enables the analysis of data for better management of business. It’s an exciting time be part of the evolution of our connected world.